ABOUT – Get Better. On Purpose. Eric Jones played college golf at Stanford University and later served as an assistant coach under Wally Goodwin. He’s the 2003 Re/Max World Long Drive Senior Champion and the 2012 Super Senior World Champion. He has competed in the World Long Drive Championship finals each of the last 14 years, notching an additional three top-3 finishes. 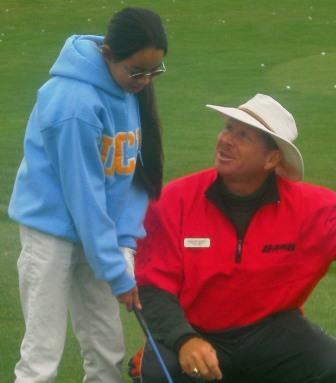 Eric is a PGA Class A Professional who also holds a Master’s degree in Sport Psychology. As founder of the Eric Jones Golf Academy he has been recognized nationally for his innovative approach to instruction, most notably his Golf Coach Program. Eric founded the Eric Jones Golf Academy to help his students do one simple thing: learn to play better golf faster. He’s defined Target Centered Golf is the art of playing golf with automaticity, allowing the natural athlete to emerge through the mind of imagination with the target as the central focus of the swing. This doesn’t mean mechanics aren’t important. On the contrary. As a PGA Class A teaching professional and world long drive champion, mechanical and technical information has to be the focus of any student’s learning. But, mechanics should not be the sole focus of your learning. Too often, you learn mechanics, but don’t get clear coaching about how to use that mechanical information to create the knowledge that ultimately gets integrated into a reliable, automatic swing you can trust. For this reason, it’s Eric’s belief that target-centered focus and other similar learning, practice and strategic play skills ought to be mastered with the same emphasis as those mechanical skills. And mastered with the help of a Coach, who helps you develop a mastery approach to the game through supervised practice. Think back on a time in your sporting life where you played naturally, athletically, creatively — with a confidence in which you felt extreme comfort, commitment and concentration. Everything worked together to put you in a state called FLOW, where you were using your natural athletic abilities to play at or beyond the edge of your capabilities. You probably remember that as pretty enjoyable experience. With a few tools, you can set yourself up to play in your ideal performance state more often. At the Eric Jones Golf Academy we don’t teach a method. 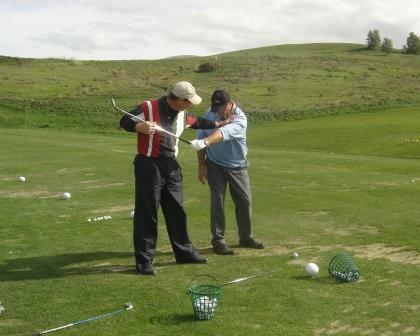 We teach you to play better golf by helping you develop your swing around your capabilities. Our approach balances swing mechanics with a scoring focus and positive mental techniques to bring out the best in your game. You’ll learn what it takes to build a repeatable swing you can trust and the effective practice techniques to take that swing to the course. Eric will address every part of your game, including driving, woods, irons, putting, chipping, bunkers, specialty shots, course management, golf fitness, sports psychology, and custom club fitting using the industry’s latest technology. Eric’s goal is to give you the right tools in an interesting, compelling, and, above all, practical manner. He knows how much passion you have for the game. It is his privilege to coach you toward the game you know you can achieve. Eric’s training programs and books can be found at the Internet Golf University www.igolfu.com.